I have to say overall, I did throughly enjoy “Ghellow Road” by T.H. Waters, however it was a busy month for me so I didn’t get to my blog as much as I would have liked. I won’t say too much more about this book other than I think the author showed readers an excellent look into her life and the struggles she faced throughout. For a first time writer, T.H. Waters told the story very well, the recommendations I would make with this book going forward in order to allow the story to flow better is to include chapters within each of the books. I feel it offers the readers the joy of anticipation. I also feel the author’s use of capitalization in unexpected places was jarring to my mind and broke the fluidity of the reading for me at different points. I did enjoy this book very much and I do recommend that people give this author the chance by reading her life story. It reminded me that each of us has our own struggles throughout our lives and this T.H. Waters gave all of us a great glimpse into hers. I want to thank the author for giving me the opportunity to review her book and I wish her the best of luck with her future ventures! Everyone – please check out the author’s Web site at http://www.verefor.com. As promised, I am announcing my next book for May, this one is extra special because this book will be my first book review, author T.H. Waters has asked if I would review and share her new book “Ghellow Road” with all of you! I have already begun reading and from what I’ve read so far, it will definitely be an interesting and excellent read! 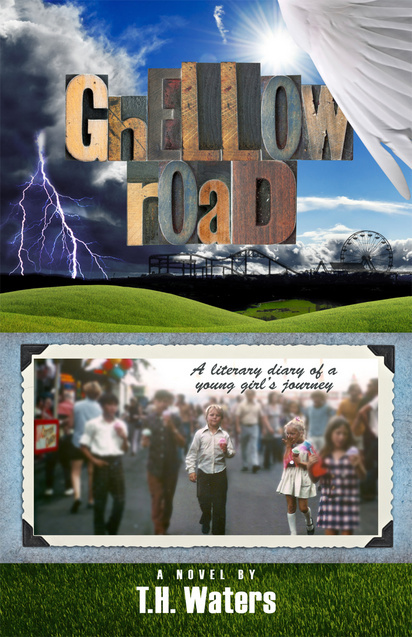 “Ghellow Road” is a literary diary of a young girl’s journey through the tangled labyrinth that is her life. Theresa’s story begins in a large mid-western city where she is born to loving parents in 1965. For a brief moment in time, her life is full, as is her heart, and the world is hers to receive without consequence. As time passes and Theresa grows, supernatural forces begin to shape her existence, no matter how carefully her father colors the empty spaces of her world. After a series of tragic events, Theresa and her family seek refuge in a small Minnesota town nestled near the shores of Rainy Lake. She creates a new life for herself there, sharing adventures with friends and riding the ups and downs of adolescence, yet through it all, her mother remains forever lost in the prison of her own mind and forever lost to Theresa. The young girl feels as though she is leading a double life, one that no one else could possibly understand. She begins to peer at the world as if looking through a thick, black veil, never certain which pieces are illusion and which are not. Through the kindness and support of the townspeople, she eventually summons the strength to survive. This is a story of tragedy and triumph. Ms. Waters was raised in Minnesota and currently resides in Minneapolis with her significant other and their two cats. In a recent e-mail she tells Books From My Closet that she has always been a life-long lover of the written word. Ms. Waters didn’t consider herself an author until about eight years when she received news that her brother had died suddenly at the age of 39. A few more years would pass before her significant other encouraged her to take her passion for writing and use it to create her life story, Ghellow Road. To see more about Ms. Waters’ book, visit http://www.verefor.com. And be sure to check back on my blog posts of the book as well! Until then..